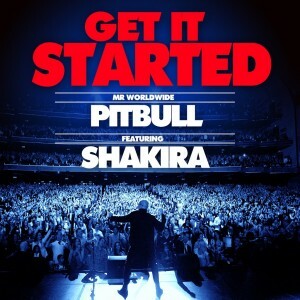 The next chapter in the story of Pitbull starts right here, folks… ‘Get It Started’ serves as the lead single from the rapper’s forthcoming album ‘Global Warming’ and features Latino goddess Shakira in a guest vocal role. Pitbull’s been a regular on the Aussie charts in either headline or guesting guises since his single ‘I Know You Want Me (Calle Ocho)’ tore up the ARIA top five three years ago. His latest single ‘Back In Time’ (lifted from the soundtrack to the latest ‘Men In Black’ film) has achieved double platinum sales and every single from his latest LP ‘Planet Pit’ sold at least platinum; six times platinum in the case of his smash hit ‘Give Me Everything’. Pitbull visits Australia for a live tour in August, with the album also due later this year.